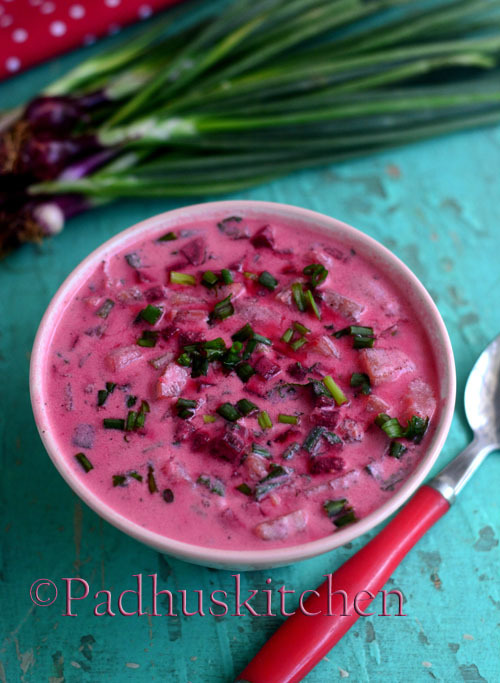 Beetroot kefir cold soup is quick and easy to make. 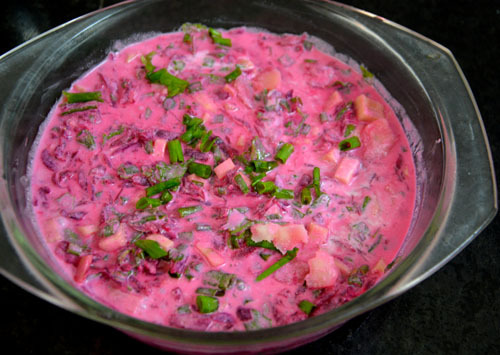 It is called cold borscht and is very popular in Lithuanian cuisine. This soup is served cold. I have made slight changes to suit my preferences. Cold borscht is served chilled with warm potatoes and hard boiled eggs. It makes a light and nutritious lunch. 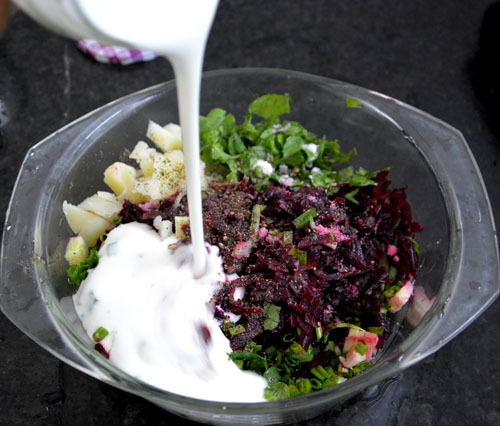 Today we will learn how to make Beetroot Kefir cold soup following this easy recipe with pictures. Pressure cook potatoes for 2-3 whistles. Once the pressure subsides, peel the skin and dice it. Let it cool completely. In the meantime, wash, peel the skin and chop cucumber into small pieces. You can also grate coarsely. Hard boil eggs. Shell it and cut it into quarters. Adding eggs is optional but cold borscht is served topped with eggs. In traditional cold borscht, dill leaves are used. 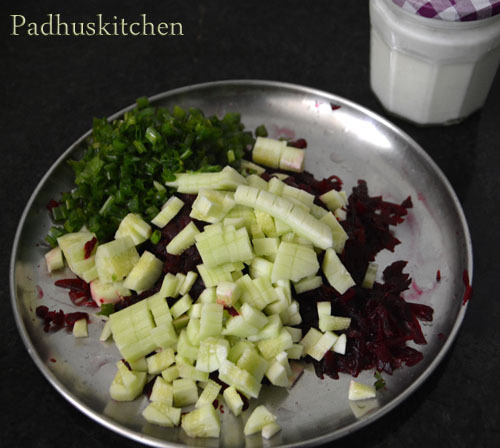 As I could not get dill leaves, I have used finely chopped mint leaves. 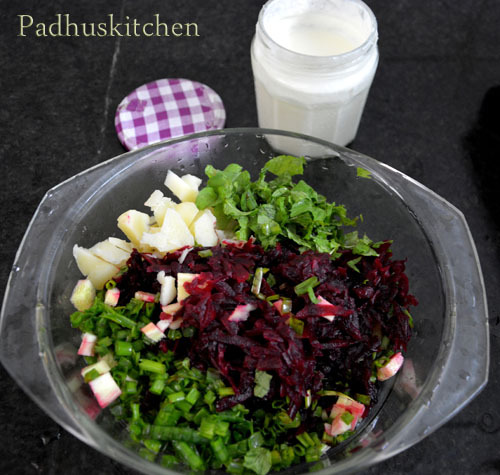 In a bowl mix together potatoes, cucumber, grated beetroot, spring onion greens and mint leaves. Add salt and pepper powder to taste. Then add a cup of milk kefir. You can adjust the consistency by adding a little more or less kefir. You can also add a little water to adjust the consistency to your liking. Mix well and garnish it with spring onion greens. Refrigerate the soup for an hour. Before serving, add eggs and garnish with more spring onion greens and fresh dill leaves. Serve chilled. Kefir contains high quantities of beneficial bacteria and yeasts. So this soup is very nutritious but kefir is not commonly available in India. The good news is, you can make kefir at home using kefir grains. It is very simple to make kefir at home. Check How to make Milk Kefir at Home using Kefir grains. Note - You can substitute kefir with thick buttermilk.